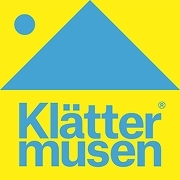 Experience the mountains in the province of Jämtland in a different way. 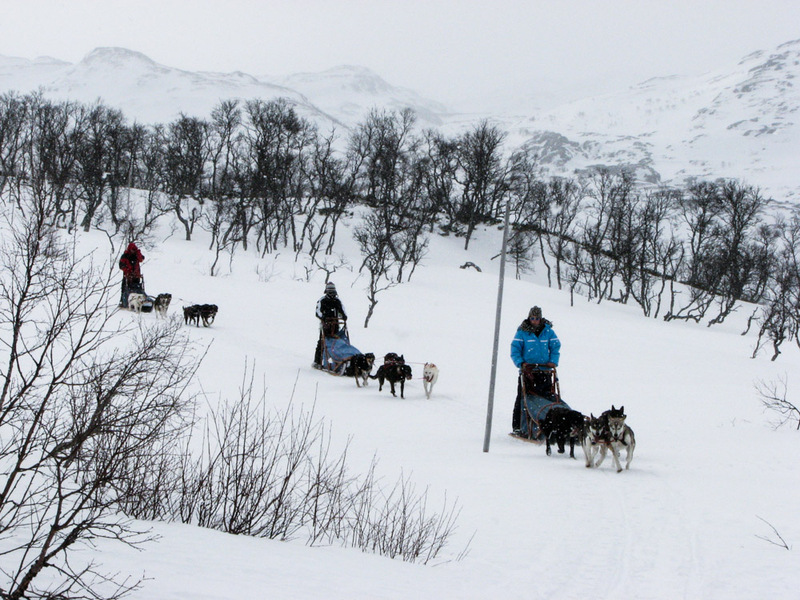 Do a longer tour with sleddogs for several days in the wilderness. We go through quiet and unspoild countryside and you are able to see reindeer, lynx, arctic fox and wolverine. You might see northern light too. 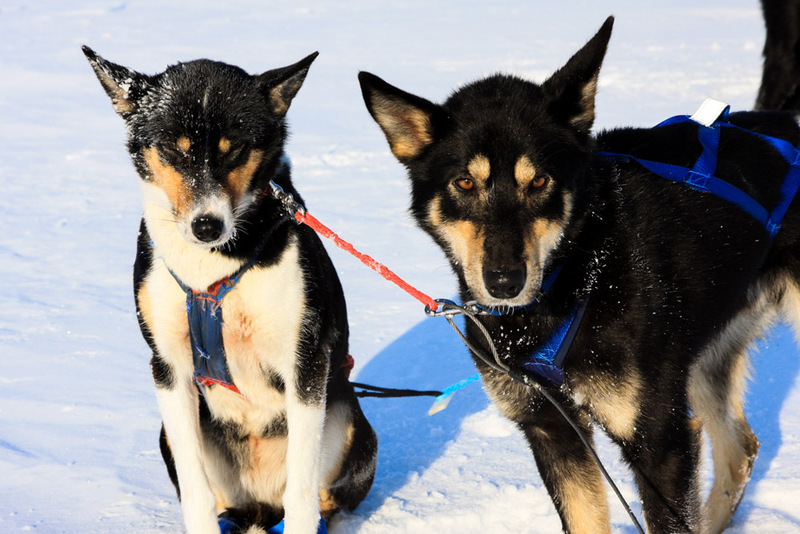 We teach you to drive your own sleddogs of 4-5 Alaskan Huskies. The tours go through the forest and up on the mountains. We go between 15 to 40 kilometers per day. We start the tours in Vålådalen and go up on the mountains and spend the nights in cabins or tents. 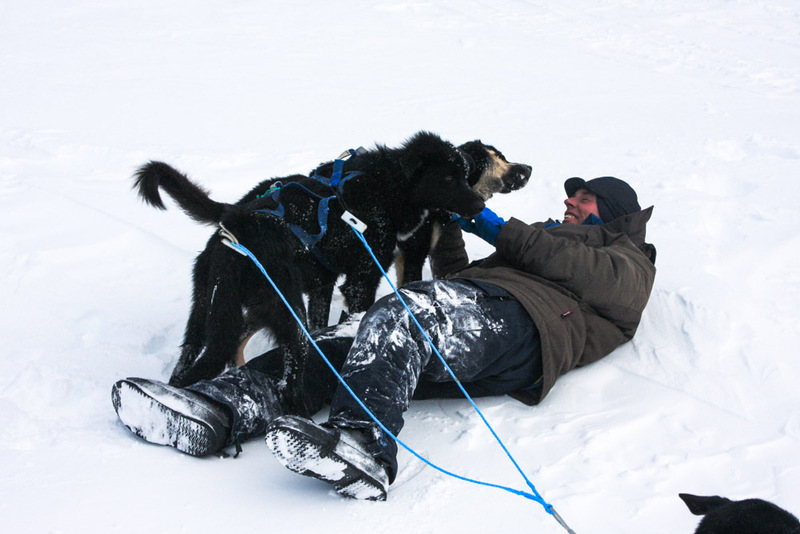 Driving with sleddogs can be hard work sometimes, so you need to be a little bit fit. You stand on the back of a sled, without skiis and get pulled by the dogs. 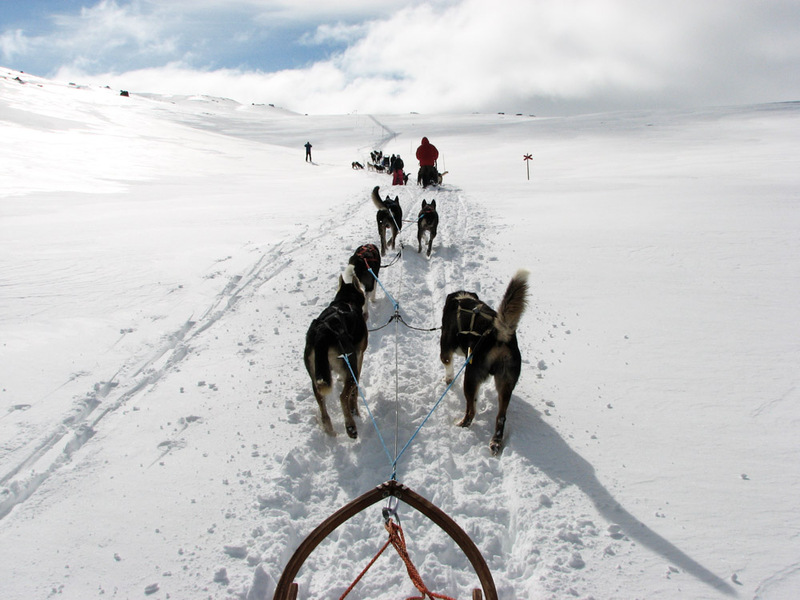 You help the dogs uphill by pushing the sled, in the curves you lean inwards to not flip over and brake when it is necessary. How to get here: Take the train to Undersåker station (80 km from Östersund) and then then bus or taxi to Vålådalen (25 km). Fly to Östersund/Frösö airport, then train, bus or taxi to Vålådalen (10 km). Links to communications under “links”. Transfer not included in the price. 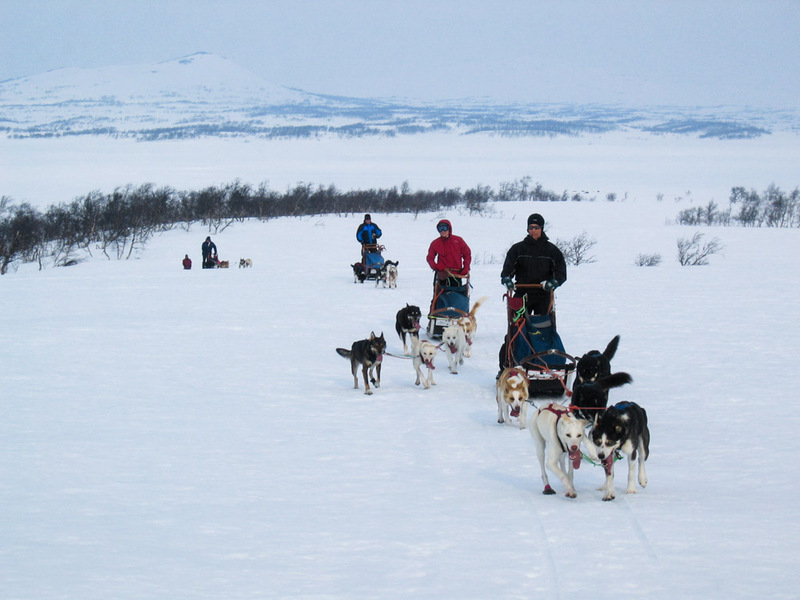 Take the night train or fly from Southern Sweden and join one of the oldest dog-sled companies in Sweden on a fast-paced expedition through the mountains of Jämtland. There is something truly primeval about travelling through the mountains with dogs that run and make the snow fly. 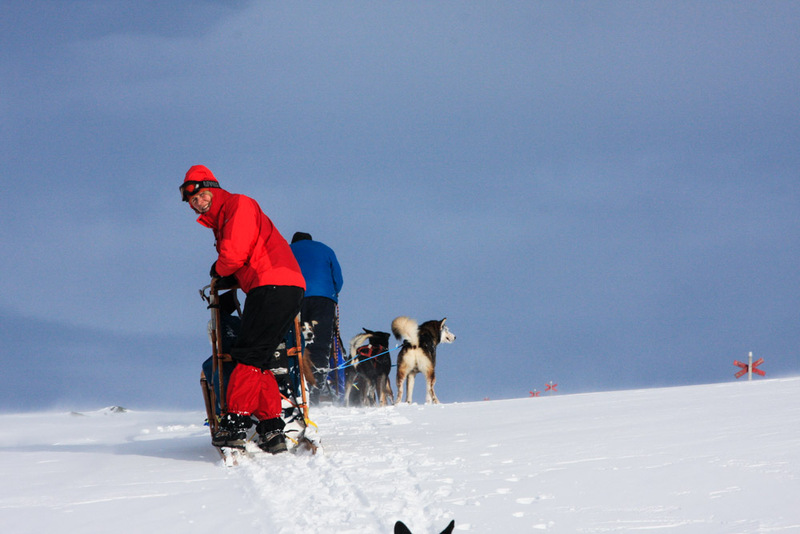 Everyone can learn how to harness the dogs and drive a sled. 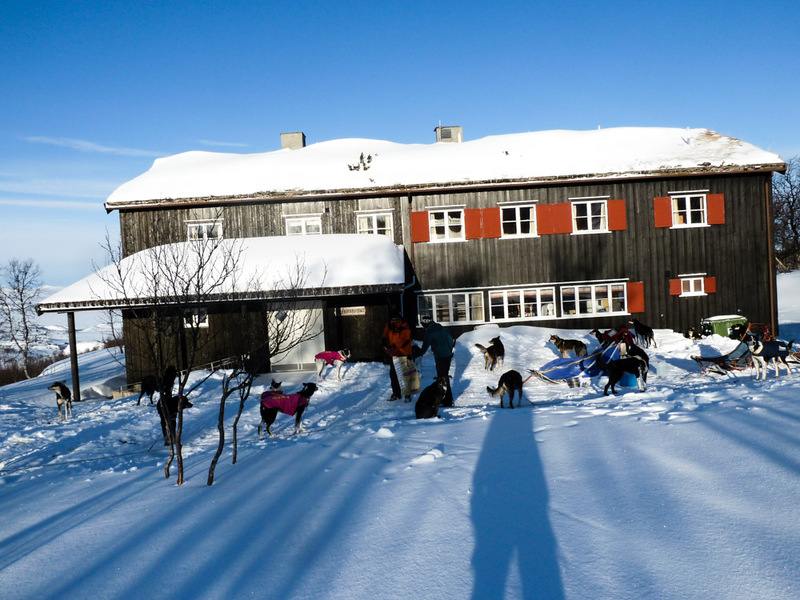 The tour starts at Vålådalen Mountain Lodge in the mountains of Southern Jämtland. The dogs are very keen to start running. Soon, all you hear is the rushing silence when the party gets going. 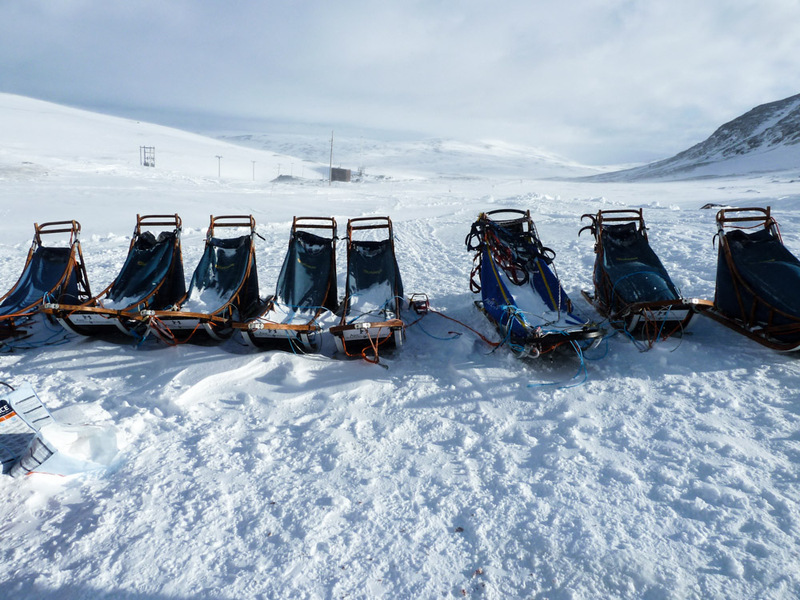 The sleds travel in the border area between the alpine forest and the open area above the tree line. At the Vålå hut, which is a self-service cabin, everyone helps to start a fire, melt snow for water and prepare dinner. Of course, the dogs also need to be fed and taken care of. The next day, the journey continues mostly on flat terrain and downhill, with a bit more technical driving than the day before. Along with lunch you get a magnificent view over the mountain world. The tour concludes back at Vålådalen Mountain Lodge. 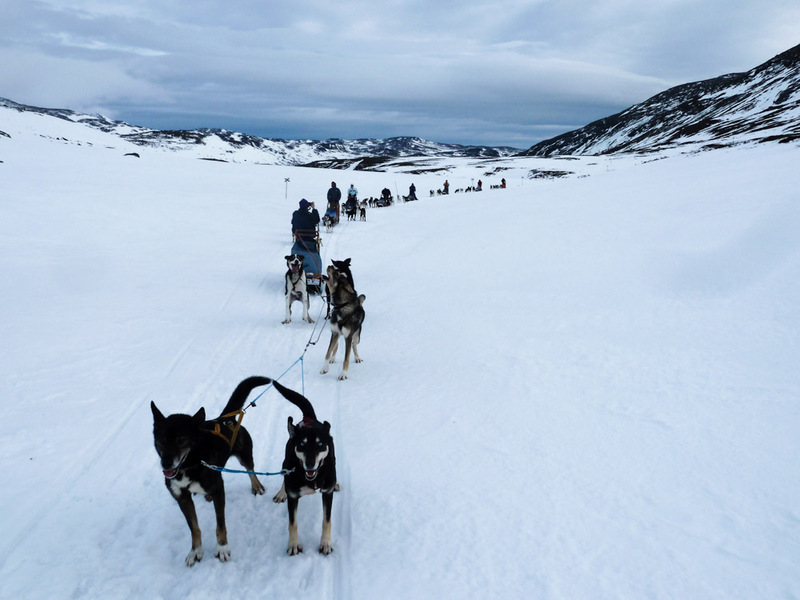 Take the night train or fly from Southern Sweden and join one of the oldest dog-sled companies in Sweden on a fast-paced expedition through the mountains of Jämtland.There is something truly primeval about travelling through the mountains with dogs that run and make the snow fly. Arrival at Östersund/Frösö Airport, transfer to the little village of Vålådalen, where the first night is spent at VålådalenMountain Lodge. 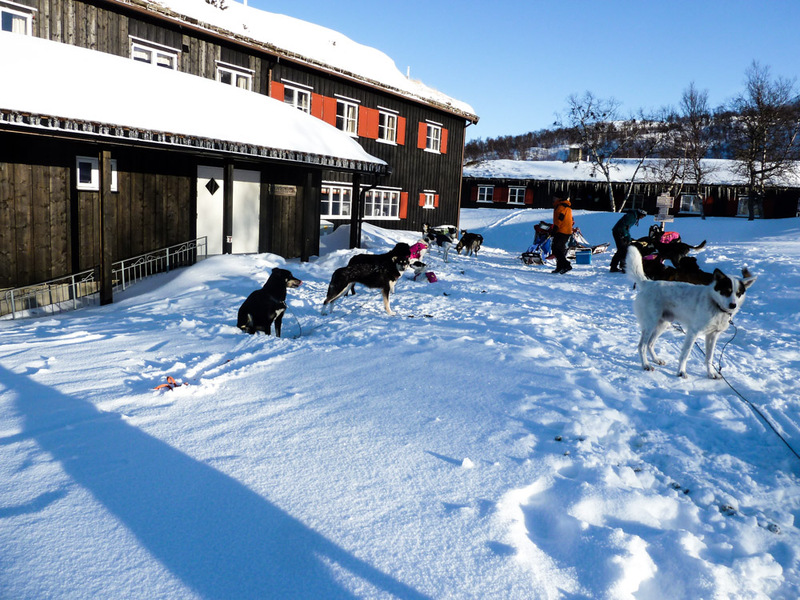 The dogsled trip starts on the morning after at Vålådalen Mountain Lodge. The dogs are very keen to start running. Everyone gets a dogteam of their own, 4- 6 dogs. We have Alaskan Huskies, the best sleddog there is. Soon, all you hear is the rushing silence when the party gets going. The trip starts in a forrest that is several hundred years old, we drive through Vålådalens nature reserve known for it’s many species of wildlife. Towards Vålåstugan we travel in the dividing line between the mountain birch forrest and the bare mountain region. After 22 km we reach Vålåstugan (Vålådalen) where we stay overnight. It is said that it is gold in the ground here. Old mine holes witness of strenous quarrying. We melt snow for water and make a fire in the iron stove. The toilet is outside. At Vålåstugan, which is a self-service cabin, everyone helps to start a fire, melt snow for water and prepare dinner. Of course, the dogs also need to be fed and taken care of. We leave Vålåstugan heading towards Gåsen, a cabin with the same conditions as Vålåstugan. A distance for about 20 km. We stop halfway for lunch as we did the day before. Gåsen is the highest peak of the trip, 1100 meters above the sea level. Here we stay overnight and everyone helps out with taking care of the dogs and ourselves. From Gåsen we travel down towards Stensdalen where we stop for lunch. We are now in the birch forrest again. You’ll end the day after 30 km at Vålådalen Mountain Lodge with dinner and a sauna if you like. The last night is spent at VålådalenMountain Lodge. Note! In case of bad weather the guide might need to change the route. With 6 overnights in cabins. Now you can experience the mountains in Jämtland in a different, exotic and exiting way. You travel through a quiet and unspoiled landscape with the chance to see reindeer, lynx, wolverine and arctic fox. The dogs you’ll meet on our trips are Alaskan Huskies, it’s a friendly dog that runs fast, pulls hard and likes it. Everyone gets their “own” team of 4-5 dogs. We are approved by Nature’s best, which characterize the arrangement with respect of the nature. Day 1 — Arrival at Östersund/Frösö Airport, transfer to the little village of Vålådalen. Dinner. Day 2 — We have breakfast and make lunchpackages. At ten we’ll meet below the touriststation where the dogs are at. We pack the sleds, gets instucted how to harness the dogs and how to drive the sled. The trip starts in a forrest that is several hundred years old, we drive through Vålådalens nature reserve known for it’s many species of wildlife. mountain region. In Vålåstugan (Vålåvalen) we stay overnight. It is said that it is gold in the ground here. Old mine holes witness of strenous quarrying. We melt snow for water and make a fire in the iron stove. The toilet is outside. Day 3 — We are now in the bare mountain region, the trip goes to Helags. We stop halfways at Ljungans shelter for lunch. The cabins at Helags are situated at the foot of Swedens southest located glacier and the highest peak south of the Arctic circle, 1797 meter above the sea level. Helags cabins have modern standards, there’s also shower and a sauna here. Day 4 — We leave Helags heading towards Sylarna, 1743 meters above sea level. We stop at Mieskentjakke with a magnificant wiev towards both Helags and Sylarna. Sylarna has also modern standards. Day 5 — From Sylarna we travel to Gåsen, the cabin is the highest located mountain cabin in the Sweden Tourist Assocaitions possess. 1100 meters above the sea level. Day 6 — From Gåsen, the highest peak of the trip, we travel down towards Stensdalen where we stop for lunch. We are now in the birch forrest again. You’ll end the day at Vålådalen Touriststation with dinner and a sauna if you like. Day 7 — Breakfast. Transfer to Östersund Airport. In case of bad weather the guide might need to change the route. To get the most out of the trip it’s good to have some condition. Departures: Arriving Saturday. Leaving Friday. produce spectacular displays in the night-time sky! Now you can experience the mountains in Jämtland in a different, exotic and exciting way. dog that runs fast, pulls hard and likes it. 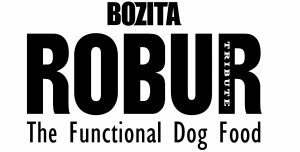 Everyone on this experience will get their own” team of 4-6 dogs. During the night you will stay in tents or tepees and cover between 25-35 km/day. You drive through mountain birch forest and over the vast mountain plains. The area you will travel through has a snowmobile restriction – so it will be just you and the dogs in the white wilderness. Day 1 — Arrival at Östersund/Frösö Airport or at the train station in Undersåker, transfer to Storulvån mountain station. Here you will have your first dinner together. Your guide will inform about the practical details of your tour and go through the route of the tour. Day 3 — First you feed the dogs and then it is time for your breakfast!. 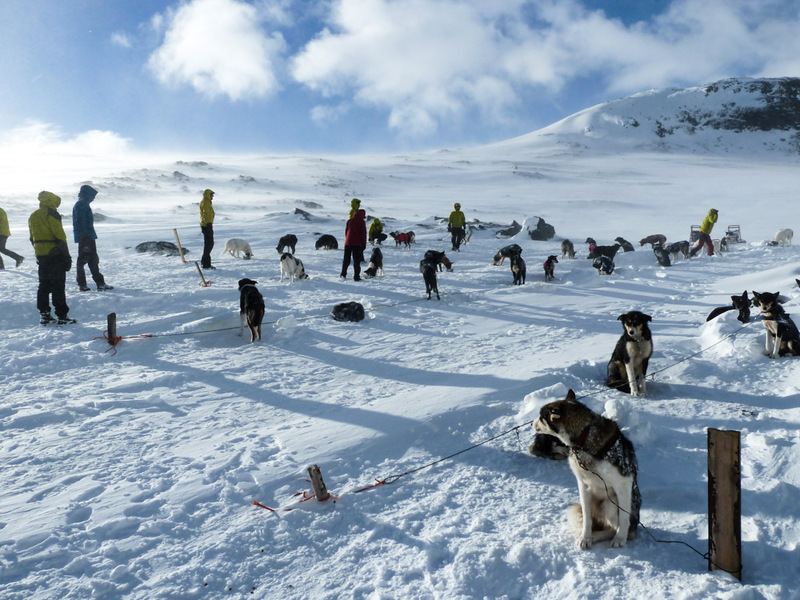 You pack up the tents, the sleds are packed and the dogs are harnessed and then you are off. Today’s stretch is on the Norweigian side of the border, with a wide view over distant hills. In the afternoon you reach the Essan lake, a lake famous for its Arctic Char fishing – here you will stay for the night. If you want to try your luck at fishing, now is your chance! Day 4 — You will continue east through a snow-rich landscape over 2 large lakes and pass Nedalshyttan – then in the mountain birch forest you will set camp for the night. Day 5 — This day starts with a steep climb upwards towards the open mountain plains and you are now back on the Swedish side of the mountains. You will camp for the night on the back of the Helags mountain, 1797 m.
Day 6 — The reindeer should now have come out from the surrounding forest landscape. Here you have a chance of seeing herds of reindeer. You will travel carefully through the area so as not to scare the animals. You will pass Helags mountain station, and from here you get a view over Sweden’s most southerly glacier. During the afternoon you pass Tjallingens Sami camp and now you reach the birch forest – now it is just a couple of kilometers before you reach Storulvån with sauna and dinner. Day 7 — The week ends with breakfast and transfer to Östersund Airport or the train station in Undersåker. Please note that in the event of bad weather the guide might need to change the route. Day 1 — Transfer from Enafors to Storulvån. Dinner. The guide provides information on practical details and review of the tour and gasket. Day 2 — Breakfast. You’ll then get information on the most basic of dog driving and instruction how to harnesses the dogs, dog handlers and the span control tray. Once the tray is packed we start the tour. After a heavy pitch, we are on top of the mountain with them white expanses and the distance we see Sylarna. Today’s goal is Blåhammaren with a fantastic view and the best food. Sauna and shower. The dogs put on long virers every night and be fed, watered and we are digging shelters for them in the snow. Day 3 — The dogs are fed first, then it will be breakfast in restaurants. Tray packed, the dogs selas and then we start with a long downhill, then we will enter the Norwegian side, where we cross the border river Enan where we will take a lunch break. The tour will now move into Norway with wide views over the countryside, in the afternoon we reach today’s goal Storeriksvollen that once upon a time was a fäbovall but now is a huge cozy mountain huts with fine views over Essansjön and mountains. Shower and really good Norwegian food is offered it. Day 4 — We will stay here a night to. First, we take care of the dogs, then we eat breakfast. Tray packed with the little we need for a day trip. The trip goes through fjällbjörk forest and lakes. For those who want to try to ice fishing, there is opportunity. Day 5 — Today we aim to do Sylarnas mountain station below jam transparency which is 1743 möh. Sauna, shower and a good meal waiting even at Sylarna. Day 6 — Have we not seen reindeer before so chances are great today when we go down to Storulvån. We travel carefully so as not to frighten them. If weather permits we will take a longer lunch break in the sunshine: Shower, sauna and a nice noon finishes week. Day 7 — Breakfast. Transfer to Enafors. The trip can be changed if the weather is bad. Experience a different and exiting fishingtour. We use sleddogs to go out in the wilderness to nice lakes in the mountains. Usually we do these tours in springtime in april or may, when the days are longer and the sun is warm. This is a wonderful experience. We spend the days laying down on reindeer skins on the ice, and do fishing. In the evening we go inside the hut and cook the fish over open fire. Day 1 — Arrival at Östersund/Frösö Airport or at the train station in Undersåker, transfer to Storulvån. Here you will have your first dinner together, the guide will take you through practical details and the route for the coming days experiences. Day 2 — In the morning you will start by going through the personal equipment you brought and your guide will hand out warm shoes for those who need a pair, after which you go outside and pack the sleds. You will now be instructed in how to harness the dogs and how to drive and handle the sleds. Soon you will head south and after 20 minutes you are up on the mountain plains with a magnificent view. After a few hours’ driving you break for lunch at the Norwegian border, then you have approximately 10 km left to cover before you reach Essansjön in Norway. When you arrive, you unharness the dogs, raise the teepee and prepare the camp. 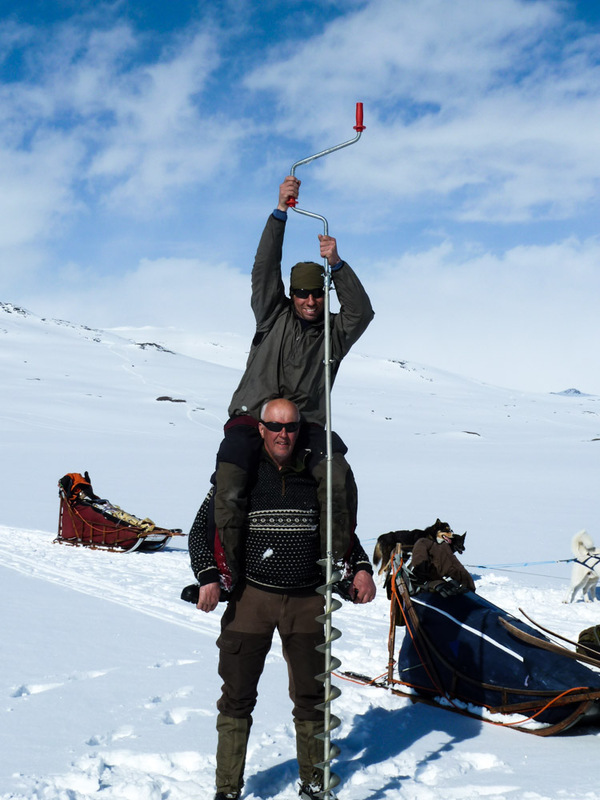 Later on you head out onto the ice and drill holes through the ice to try your luck. Day 3-4 — You get up early and head out onto the lake and fish, giving the dogs a chance to rest. An hour or so later you eat breakfast and feed the dogs. Then you continue fishing and finish the day with a dinner made from the day’s catch! 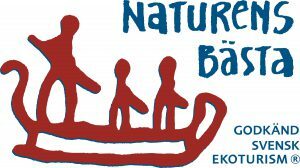 Day 5 — You take the sleds and drive to Nesjön to try your fishing luck there. Day 6 — You head out early and fish for about an hour. 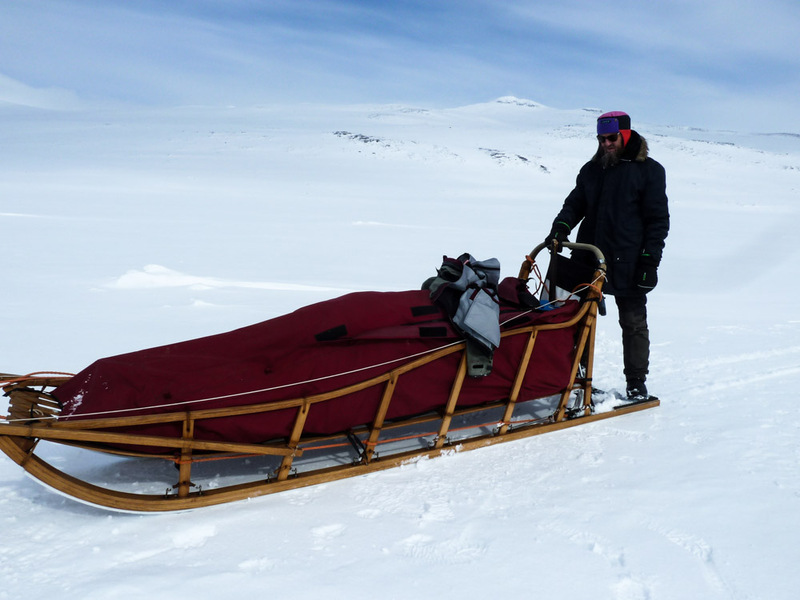 Then you pack the sleds and drive towards a small mountain lake (Fiskåtjärn), where you will drill some holes and fish for a while. Then you will continue towards Sylarna and Storulvån. Day 7 — Breakfast. Transfer to Östersund Airport or the train station in Undersåker. Please note that in the event of bad weather or lack of snow the guide might need to change the route. 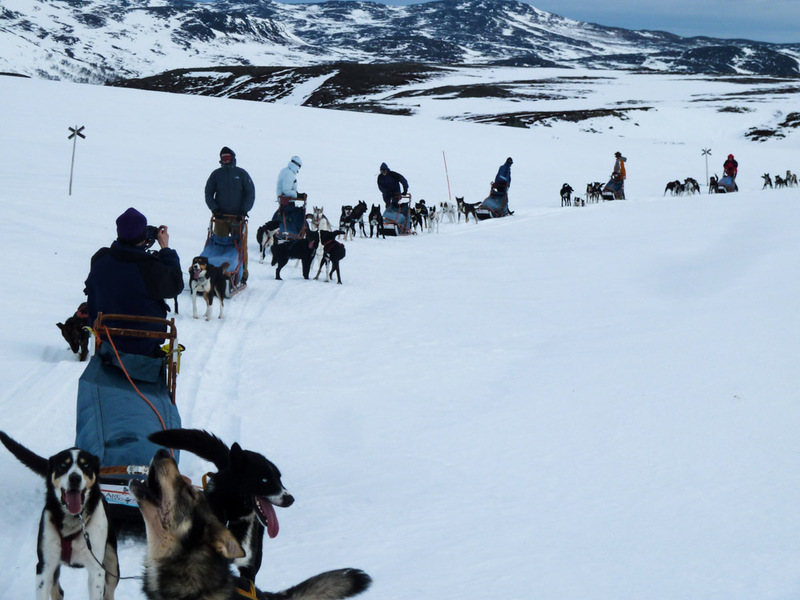 If these sleddog tours dont suit you, we can arrange a tour after your desires. Where in Åre are you staying? All prices are per person and in Swedish crowns. For the five-day tours with tents, you need to bring your own camping equipment, such as a tent and a portable stove. On the five-day tours in cabins, lodging is included for the night before, and the night after.